HOTEL, Theater and convention center. 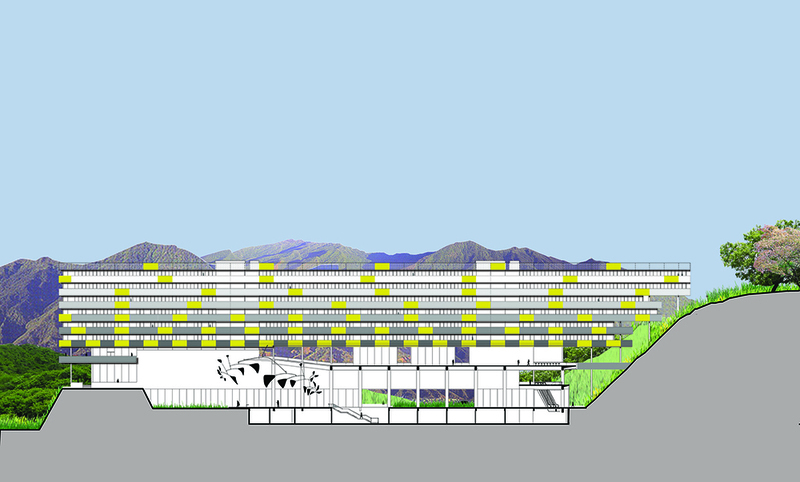 Placing a large hotel at the current site of Caracas’s Círculo Militar, that respects and values the complex in which it is located, while maintaining its autonomy and linkages, is not an easy task. This design arose from a critical reading of the Conjunto Vial La Nacionalidad, the Escuelas Militares and the Círculo Militar (The Nationality Road Complex, Military Schools, and Military Circle), including the winding green topography that serves as a backdrop to these buildings. 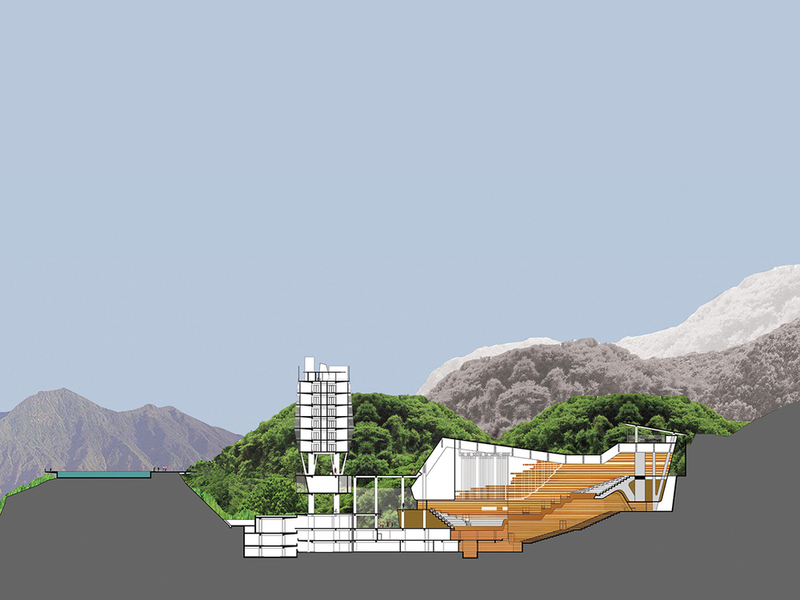 The idea is to create a set of buildings that, rather than standing out in the the landscape, would amalgamate within it, producing new linkages between the existing buildings and making the best possible use of the beautiful city views from this site. One of the most striking topographical features of the terrain is the presence of a well-defined hill that serves as a backdrop to the Salón Venezuela. This hill, which approaches the complex that was built over half a century ago, is alongside a small valley, where currently several service sheds are located. This side-by-side convexity and concavity of the topography suggested the possibility of relating these two geographical features while maintaining them as attractive elements of the landscape. 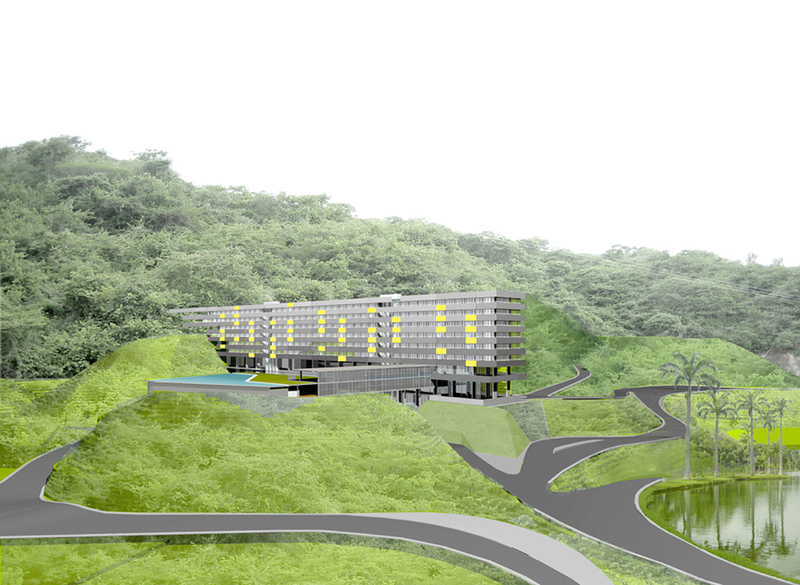 The element proposed to relate the two is a large straight prism with a rectangular base, containing the hotel rooms. The hill is taken as a natural base for the wide viewing terrace that contains the large swimming pool, while the small, relatively hidden valley is the site of the great Convention Center. This prismatic element, the largest mass in the complex, enjoys an optimal orientation facing north, adopting the criterion of the Círculo Militar’s first housing block. This location also enjoys the best views, primarily towards the Paseo de Los Precursores. The hill is allowed to show off its natural greenery, acting as a backdrop for the Salón Venezuela. Its upper esplanade serves as a large viewing terrace that also houses the pool and its services. The great prism is linked to efficient parking spaces that use its foundations and structure.